Gwen D.'s Kenzai Reach program, Reach | May 13 2019, starts in 20 days. 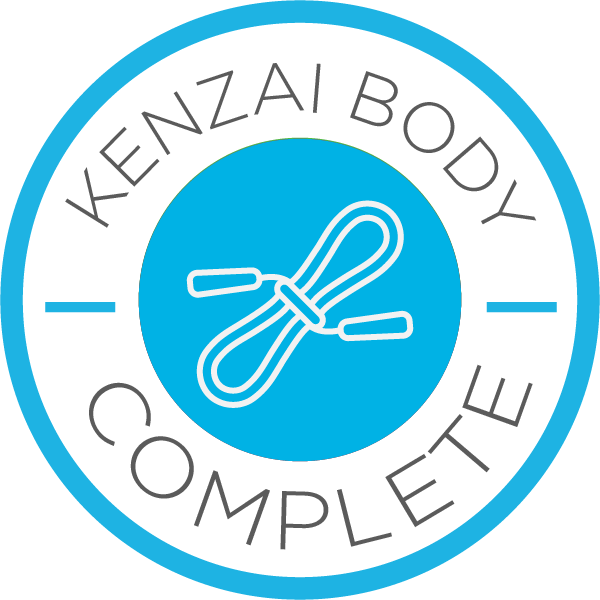 I can’t believe the day is here to end my Kenzai Body program. I lost a total of 12 pounds of fat. Gain a few pounds of muscles. And down to 1 size in clothing. My energy level is higher and I feel stronger. It has been a life changing experience for me physically and mentally. I love reading the lessons on a daily basis and was excited to see what exercises are up next. Although there were some days I wanted to skip the work out, I stayed focused and followed through. 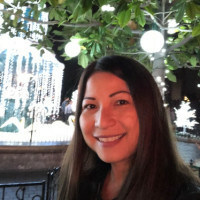 During the 90 days, I only skipped 4-5 days due to fatigue and sickness. Which I myself think that isn’t too bad. I was also 95% committed to the diet without salt and sugar. Overall, the progress that I’ve made throughout this program was because of the amazing support system that I have from family, friends, my Kenzai trainers and my Corvus team. With that I want to say thank you to a few people. To my sister Mai and my brother-in-law Nick for introducing me and my husband to Kenzai. You guys have been supportive from the start. It was fun discussing the ups and down of the program with you guys. To my trainers (Kim and Ed) for all the advices and encouragement. Thank you for always bringing positive vibes to our group. To my Corvus team for all the stories and comments. It was nice to hear your struggles as well as your achievements. You guys are a great group and I am honor to be a part of this community. Good luck with your next adventure. To my husband Jay for signing me up and sharing this unforgettable journey with me. Your dedication, determination and motivation have inspired me beyond words. Thank you for encouraging me and believing in me when I don’t believe in myself. You are my strength and greatest supporter! How are you? Hope everyone is doing well. This week has been good so far even though I had stomach cramps for a couple of days. So diet was sorta off (didn’t feel like eating). Workouts are good. 9 more days to go so I’m excited to finish strong. Sorry I’ve been MIA. Week 10 had been a rough week for me since I wasn’t feeling like my self. Had headaches and body aches on and off so couldn’t focus on keeping my workouts at 💯. The diet has been off when my body is not feeling good. But we were able to relax and enjoy some snow days and was happy that the indulgence came in just in time. My diet was so off although I didn’t go crazy but just munched on some non-Kenzai snack (cheese, peanuts, chips, and beef jerky). Although they tasted good and satisfied my cravings, my stomach was not feeling good afterwards. Will be better these last 3 weeks. 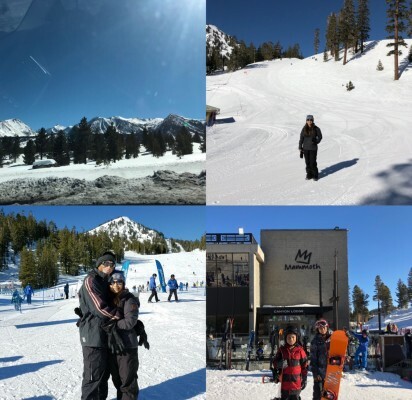 Overall, had a great time with the family since it’s our kids first time in the snow and Mammoth mountains were gorgeous! Hope everyone is doing well and keeping the momentum going. 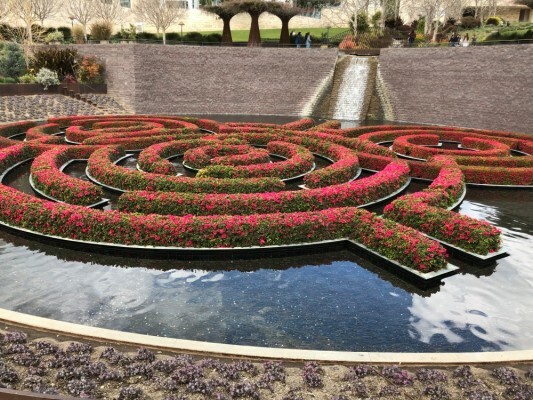 Today I was able to enjoy the serenity of the Central Garden at The Getty’s Museum. Beautiful view on a beautiful day after all the rain. Felt relaxed and ready for week 10. After reading the lesson for today, it made me think a little. Yes, first impressions are important and those are usually how people judge us in some sort of way but they don’t define us of who we really are. Although have to admit that by choosing to be on Kenzai program has helped me to have a different perspective on fitness and health. I see myself making more active choices over the past weeks like parking far and on higher level in the parking structure so that I can walk more. Or doing outdoor stuff with my kids and actively playing with them. And the best part is, it isn’t how people perceive me but it’s my choice to give people the impressions of myself. So thanks all for being on this journey with me. Let’s continue and don’t loose focus! Sorry for the late blog. It’s been a slow week for me. Body is not 💯 but I’m still moving and staying on track. Today although I didn’t do the jump rope but I went on the rowing machine for 15 minutes so, I feel pretty good. Diet is good. Happy to read everyone’s blog which keeps me motivated. Thanks all! Great day for indulgence 2. 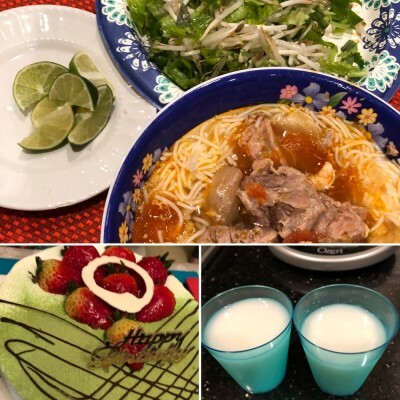 Celebrated our mama’s birthday and had some great Vietnamese food. Noodles, pate chaud, cake, almond jello. So much food! Was excited to eat and they were good but was too full and uncomfortable afterwards. I guess my stomach is shrinking so cannot consume the same amount that I used to. That’s a good thing! Workout is 💯 although my body is feeling the pain and soreness. Hope everyone is enjoying the weekend! Week 6 was so so with diet. Let’s say I was 90% compliant (nothing drastic) since I went out with some friends for a couple of days. 💯 on workout so I am pretty happy with myself. Today (day 43) was a hard work out especially with the jump rope and side sit-ups. I am trying really hard but was only able to do 3 sets of 2 minutes straight. The other 4 sets I had to rest in between so not so happy about that. And side sit-ups never get easy for me. Even so I finished my workout for the day. Still not used to my dinner meal but I’m trying my best. Great to hear that you all are still at it and going strong. Keep it up team! Week 5 is all done! Week 5 was a little harder especially with diet. Didn’t feel like eating at night since my stomach has been feeling strange. Maybe it’s because I am not used to eating apples and yogurt at night. And just saw my diet for this week it’s the same with no banana 😕, hopefully my stomach will get used to this soon. Hope everyone is doing great! Today is Lunar New Year the year of the Pig 🐷! It’s our tradition to celebrate with family and friends. 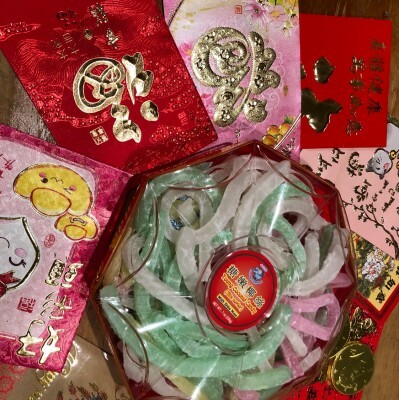 We usually eat great food, gamble, and receive lucky red envelope with money in it. Yesterday, although I had just a little of my mom’s cooking for New Year’s Eve (it’s our tradition), I didn’t over do it and barely ate. And I was tempted to eat all of those great food again today, but I resisted them. Not gonna lie, I was a little sad 😔 but I’m glad I followed my Kenzai diet and stayed with it. Workout was a bit slow since I didn’t get enough sleep last night but overall, it’s good. 1st month in the book! It’s raining all day today. 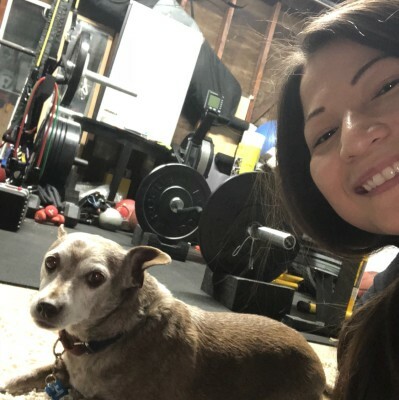 But it’s a good day to workout, especially with a workout companion (see photo). Have a good rest of the weekend everyone ! What can I say, I’m just excited about this as anyone else I’m sure. Enjoy it Team! 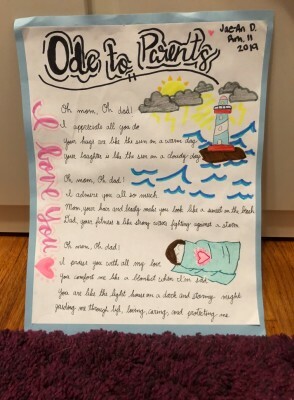 Just want to share a poem from my daughter that melts my heart. She wrote it in class for parents appreciation day! Diet is on track! Still missing my salt but overall, I’m doing fine. Hope everyone is doing well. Last week I didn’t feel that accomplished since I was bloated and kept getting headaches and tummy aches. But I did get a few compliments from a couple of my friends. So overall, I guess I’m doing something right. Okay, into week 4. 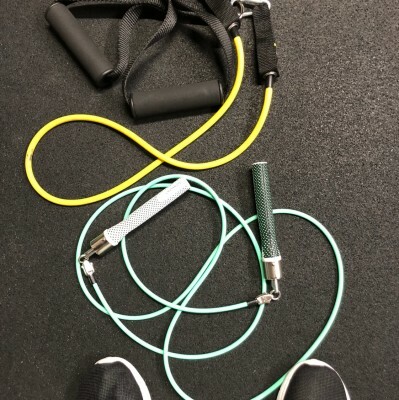 The Double Katana is no joke along with 650 Jump Rope, my arms and legs are hating me right now. 😂 Thanks for another day of pain with a purpose Kenzai! Let’s keep moving!